First and Second Place awards will be given in both Novice and Professional categories as well as the People’s Choice award. The Morean Arts Center will continue to accept entries for additional categories including Youth/Teen for those aspiring bakers ages 10-16 years old, and the Specialty category for those choosing to offer Gluten Free or Vegan recipes. Cupcakes will be judged on icing/frosting, flavor/texture and presentation/creativity for a total of 50 points, which allows plenty of room for edible creativity. 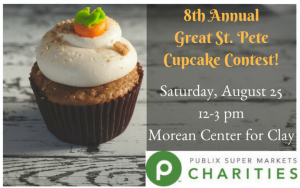 The winners will receive bragging rights around St. Petersburg and a handmade cupcake trophy by a local artist to be announced later this summer. The winning cupcakes will enjoy fame and fortune as a celebrity on the Morean website, Facebook page and city-wide media. Awards announced at 3 p.m. The People’s Choice award will be voted on by the attending audience. Participants in the contest are encouraged to bring sufficient quantities for the public to taste, but not required. Votes will be tallied and winner of the People’s Choice Award announced at 3 p.m. $5 admission will be collected to help support the Morean Arts Center’s mission of Connecting People with Art. Admission of $5 per person (ages 5+) will be charged upon entry on August 25. Each entrant will receive 5 ballots for the People’s Choice Award with their admission. Additional ballots may be purchased for $1 each, cash or credit accepted. We ask that all attendees please enjoy their cupcakes ON property. Registration will be capped at 100 contestants. Please send in forms as soon as possible. Multiple submissions are allowed, but each flavor entered needs to be accompanied by a separate registration form and entry fee. For information or questions on how to enter the contest, please call the Morean Arts Center at 727.822.7872.